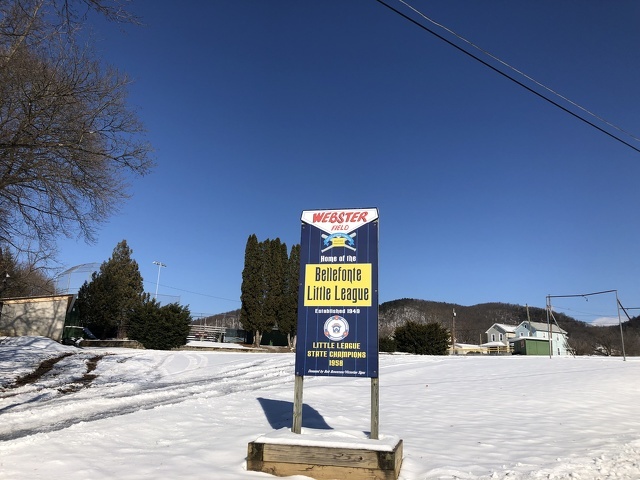 Bellefonte Little League is looking to build a new field at the Webster Field Complex. BELLEFONTE — Before you know it, the snow will melt and it will be time for the great American pastime to swing into action again. And like many communities in the county, Little League baseball is a big deal in Bellefonte. With more than 225 kids enrolled in the league over the past few years, the two diamonds at the Webster Field Complex just aren’t enough to hold all the league games. Especially when the weather is not cooperative, and the past few years — especially rain-soaked 2018 — have not been cooperative, said league president Bill Carey. The league is looking to raise money to construct a new game field at the Webster Field site, but it is going to take a little work. The land where they hope to put the field has been approved for another ball field and has been leveled off. Carey said that about five years ago league officials realized they needed to add another field and got the approval. Luckily, the land on the open field near the other playing fields was the perfect size for their needs. So now, Carey is looking at ways to raise the $125,000 to $150,000 needed to make this big Little League dream a reality for the many young ballplayers in Bellefonte. They hope to build a standard 200-foot Little League field with a diamond, dugouts, press box and scoreboard. Carey said the league does its best to keep registration fees down and receives a great deal of support from sponsors in the community, so he said they are looking at starting a capital campaign to raise the money. People who are looking to contribute or volunteer can find more information at bellefontelittleleague.org.